PhD (2007) in computational systems biology from Helsinki University of Technology (now Aalto), Finland. 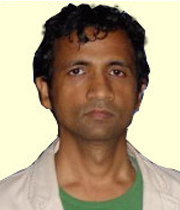 After completing his M. tech in computer technology from IIT Delhi in 2001, he started working with computational problems in the field of structural biology and statistical analysis of biological data. During his PhD, he solved the first and highest resolution (so far) structure of LDL (bad cholesterol) in native state at human body temperature. After completing PhD, Dr Vibhor started applying computational approach to genomic data and worked for 1 year at a personal-genomics company in Malaysia. He has worked at Genome Institute of Singapore (GIS) from 2009 to 2016 and has published some fundamental research findings. At GIS he was primarily working on epigenome and gene regulation and applied his findings to other branches such as cancer and stem cell study.